Moose Hunting using his Bow; Mark Shares the Story of Harvesting his Bull. Moose Hunting - Are You Ready? Preparation is the key to Moose Hunting Success. I hate to have to repeat one of life’s most valuable lessons, but; “Be Prepared”. How many times have we all heard that? You have likely been told that by people of influence throughout your entire life. However, it is one of those lessons that we all need to be reminded of from time to time. For me, this year’s Moose hunting in Canada was no exception. I was ready. The archery equipment I used for this hunt is listed at the bottom of this page. My wife says I am preoccupied with Moose; I have no idea why she thinks that way. Just because I start planning next year’s hunt the day after I return from the current years hunt? She accuses me of seizing every opportunity to steer a conversation towards Moose hunting! Our travel trailer has a Moose theme, and I am teaching my grandson, who by the way is only two, to love and respect Moose. Maybe you understand why my partners and I get together on occasion to have a beer or two (or more) and discuss past and future moose hunts... my wife can't! I try and practice several times a week with my bow, my goal is to overcome those little errors that we as archers can all make. You know, like jerking your release, not lining up your peep sight, using the wrong distance pin or worst of all - moving your head just as you release your arrow. There are of course many other things that you can do that will destroy the true path of an arrow. 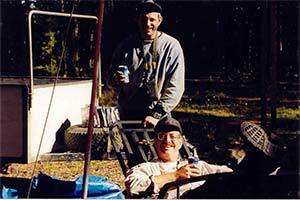 My partner Dave and I, relaxing with a beer, while trying out our homemade game cart. Well, let me explain. It is all about trigger time, arrow release time. Every competition rifle (high power) shooter I know spends his or her winters shooting either .22 calibre rifles or .177 pellet guns. These firearms have much slower velocities than your typical high power rifle, therefore when you squeeze the trigger the projectile spends considerably longer (lockup) in the barrel. If you think about this you can understand that any small move by the shooter while the bullet travels the barrel will result in an errant shot. Apply this principal to archery. Slow projectile, long lockup time. Do anything wrong... your arrow... well, does not end up where you intend! Trigger time is critical in my opinion! If you practice three days a week, shoot 36 arrows each practice day... this amounts to, (hang on, I have to get my calculator) 5,616 arrows in a year. Now that is a lot of practice. Of course, not all of that will be indoors or at short range, and you just might not have the facility to practice as often. One thing though (very important) you have to practice... good habits to be prepared for a Moose hunt. If you have bad habits and do not correct them, you will not achieve positive results. If in doubt, get some advice or take some lessons. For Moose hunting success, timing and circumstance mean everything; usually, you have no control over them. You must do your part. Close to sunset... I decided to check one more meadow before returning to camp. After a short ride on my ATV, I arrived at an access point to the area. The main road passes by this meadow and if you watch carefully as you drive by, you can just see it. This is how I first discovered the meadow. Speckled with stunted Lodgepole Pine trees and fringed with a beaver pond this meadow backs onto a small lake about a kilometre from where I parked. This spot looks like a great spot to see or call in a Moose. I have hunted this meadow in past years, and although I had passed by this spot several times this year, I had not stopped. 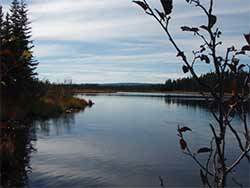 It is actually a beautiful area, the air – fresh with the smell of pine and the soothing sounds of water trickling over the beaver dam, perfect habitat for Moose hunting. An unnamed lake. Prime Moose habitat. As I walked quietly through the forest towards the meadow, my pack caught a low hanging branch, “Snap”... I froze. Carefully, I scanned ahead watching for movement. Nothing to be seen or heard, I continued until I had a good vantage point of the meadow. Making some noise while on a Moose hunt is OK, just avoid sounding like a human. Checking my watch I see I only have about 30 minutes of shooting light left. Pulling out my wind checker I determine the wind is coming from the lake, this is good. Not wanting to waste any time, I picked up my Birch Bark Moose Call and gave a Cow Moose Call. 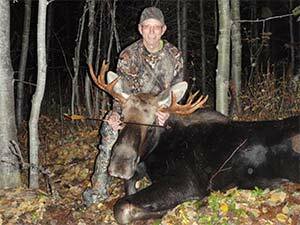 Calling can dramatically increase your Moose hunting success. If you have never heard a Cow Moose, you can imitate one. Try it. Yes I mean right now! Here is how. Cup your hands around your mouth as though to make a megaphone, while doing this squeeze your nostrils closed. Now... make this sound awwwwwwgh dragging the sound out over about 5 seconds. There, you did it, you sound like a Cow Moose. Pretty cool huh! Now you too can go Moose hunting and call Moose. “Ugh, Ugh” Instantly there was a response! A Bull Moose answers and he is close by! I am not ready! I can tell by the direction the Bulls answers are coming from that he is on the other side of the main road... behind me! “This is not how it is supposed to happen” I think to myself. OMG... I realize that I am standing in the wide open totally unprepared for this. To increase my Moose hunting success; in most instances when I call Moose, I prepare by settling in near a tree or trees that will offer me a silhouette breakup and still allow shooting lanes. I’ll remove my pack and my bow carry case, wait some time, maybe ten minutes or so then make my first call. I get ready. I did not do any of those things in preparation today because it was so close to getting dark (in hindsight I guess I was not really expecting a Moose to be there). Moose hunting can be unpredictable. Adrenalin rushes through me like a train overpowering its load. My heart pounds in my ears as I quickly move to stand beside a nearby tree. I hurriedly remove my pack and bow cover. I nock an arrow; place my bow in an unobstructed place so I can pick it up without getting tangled in grass or branches. I am ready. I call again. “Ugh” is the response, and he sounds much closer now. Through the trees I can make out my ATV parked on the edge of the road. What will happen if the Moose sees it? Will he spook and run away? Will he cross the road? Will he wind me? The brush is too thick for me to advance in the direction of the Moose and unsure of how the Bull will react to the situation, I decide my best course of action is to hold my ground and try to entice him within bow range. I have few shooting lanes toward the direction I suspect he will arrive from, but I do not have much choice, it is too late to try and move now anyway! He is just too close. I survey my situation; any shot that presents itself will be less than ten meters. I am nervous about this! Oh well, I will deal with it, somehow! I call again. He answers. He sounds as though he must be right at the edge of road. I hear branches breaking and antlers crashing against a tree as he thrashes it. “Bulls will rake trees with their antlers to demonstrate their masculinity to cow Moose as well as to scare away any would be rivals”. Then I hear it, something un-natural. I listen closely, oh no, a vehicle is coming down the road! Will he see my Moose? Will he shoot it? Will my Bull just run away? The truck passes by, no shots fired. I listen intently as the vehicle sounds dissipate in the distance. I do not want to call again until things get quiet, settle down. 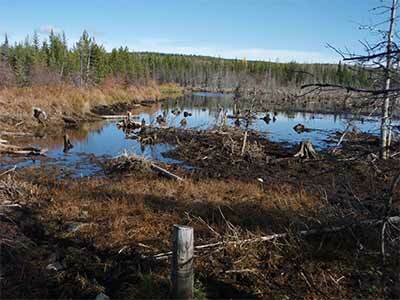 The beaver pond, where I am Moose hunting. Here I hope to call out a Bull Moose. I wait until all is quiet, I call. Nothing! I call again. This time an answer, but he is not close, he answers again... further away. Disappointed, I listen as the Bull grunts his way into the distance. He is no longer my Bull. Whew, that was exciting, and close. My heart slowly returns a more normal rhythm. I consider myself fortunate to have had such a close encounter on this Moose hunt. Hopefully, I will get another chance. Wait, that Bull, he is still grunting but now the sounds are getting closer to me. The vehicles must have put him off, but only temporarily, he is coming back. It sounds to me as though he crossed the road up where the creek goes through the culvert and he is circling back toward me. The problem now is he is approaching through the forest and it is getting dark. If you have ever been in the forest after sunset, you know that the available light is absorbed by the trees or is unable to penetrate the tree canopy. I decide that under these conditions I would not be able to make a shot, even if the Bull stepped out in front of me. My conclusion, leave quietly and return in the morning – the Bull thinks there is a cow in the area he should hang around. A wise choice for Moose Hunting with a bow. I quietly pack up my gear and leave the area without making any more cow moose calls. Upon reaching my ATV I strap everything down including my bow in anticipation of the ride back to camp. After doing up my jacket zipper to my chin, I pull on a toque (hat) and mitts; it is getting cold. Starting my ATV, I switch on the heated grips (a nice feature in cold weather). Settling in for the trip back to camp, as I depress the throttle, the cool evening air washes over me. I do not travel very far, maybe 100 meters when I crest a hill... Moose! Moose are unmistakable when you see them in the open but it takes a moment for me to realize there are actually two cows standing on the bank. I immediately start to brake while at the same time I instinctively reach for my bow. The cows do not stick around and in a flash are off the bank and out of sight, leaving, much to my surprise, my Bull Moose standing alone on the hillside. Picture this, a nice Bull Moose within 50 meters (easy Bow shot for me), broadside no less (great ethical shot)... I am not ready... again! I haven’t come to a complete stop yet. I am still attempting to un-strap my bow from my Badlands Superday Pack and then the unthinkable happens... the Bull runs. I cow call (no hands, no birch bark horn), just my voice. I notice that his pace slows down just before he disappears around the corner. After I have my bow in hand, I continue to roll down the road. As I turn the corner, there he stands, broadside and slightly quartering away. I stop. Adrenalin rushes through my body, again. I am oblivious to anything else but this Moose, I am focused! The next few seconds are a blur, but I can imagine how the event unfolded. Bow in hand, I would have had to remove the soft carry sling, dismount the ATV, remove an arrow from the quiver and nock it. Next I would be to come to full draw, find my anchor point, select the correct distance pin (somewhere in here I would have estimated the distance, 30-40 meters), settle the pin on the Moose’s vital area and finally release the arrow. “Thwack” the distinctive sound of an arrow hitting home. My Bull runs out of sight. You may wonder, how can he make this shot if it is getting dark? I can because I am out in the open here so there is considerably more available light. Not enough to see my arrow in flight though! As a rule, I shoot my bow with both eyes open, a habit I acquired when competitive rifle shooting; this enables me to see the arrow in flight as well as the point of impact. Try it, it is very effective. It was, however, too dark to see just where the arrow hit the Moose (I knew I should have used Lumenoks this year!). My mind races! Was it a good shot? What if..? I block out the bad shot scenario. I go look for blood. Near where the Moose stood are drops of bright red blood on some leaves, there, ahead are some more. I look for a few minutes but do not find a good blood trail. Still a little concerned about my shot placement, I decide to return to camp leaving the Moose undisturbed to die. After setting a waypoint on my GPS so we may return to the same spot later, I tie my bow down on the ATV. The ride back to camp was surreal; I did not even notice the cold. In my mind I relived the event over and over. I met up with my partners and explained the situation. I tell them I feel good about the shot, I just wish I could have seen where it hit, for no other reason than to boost my confidence. We discuss the pros and cons of leaving the Moose overnight, we decide to go find him tonight. After gathering the necessary equipment we returned to the spot where I made the shot. It really did not take that long to track the Moose, with more eyes to spot the blood trail, we found my Moose about 70 meters from where I shot at him. Quite dead! A Moose hunting success! As it turned out the arrow entered the rib cage on a quartering away angle, penetrating both lungs before being stopped by a rib on the far side. We could see that the Moose had pretty much just fallen over dead, bleeding out internally. There was little sign of struggle after he hit the ground because the area around the legs and hooves of the fallen Moose was undisturbed. Note:A slightly lower shot placement would have meant a better blood trail, as it was most of the blood was contained within the chest cavity. All smiles. I found My Moose. Being prepared ultimately resulted in a successful Moose hunt. High fives all around, then the work began. All the practice for Moose hunting from the previous year came into play on this day. In a moment, it was all over. The Bull Moose did not come from the meadow the way I had envisioned. Actually nothing happened the way it was supposed to, except after the shot. All the planning in the world could not have prepared me for how the events would unfold. In the end... I was ready. This was an unguided Canadian Moose hunt during an Archery Hunting Only season. Happy Moose Hunters. I met these folks near where we hunted this year. 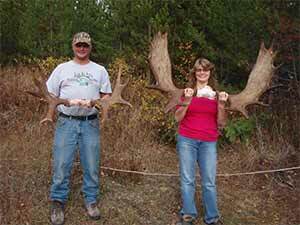 Her husband, pictured on the left called in the Bigger Bull Moose within range for her to shoot. They hunt the same area year after year, this intimate knowledge and preparation led to their success. 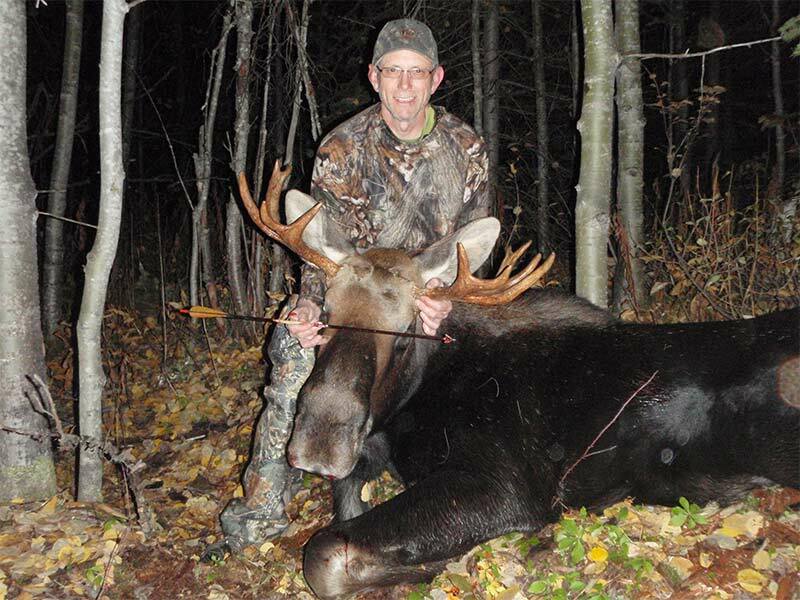 Do you have a Story about Hunting Moose you would like to tell? Share it with us here!